1National Institute of Oceanography and Fisheries, Red Sea Branch, Egypt. 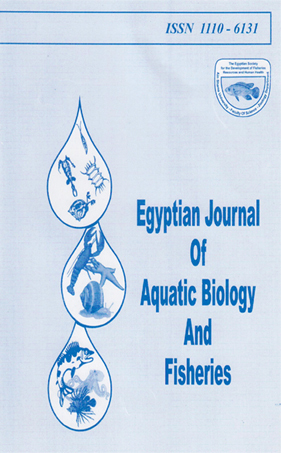 Twenty one samples from the roots and leaves of Avicenia marina and the associated sediments were collected from two mangrove swamps along the Egyptian Red Sea coast for studying the heavy metals (Fe, Zn, Cu, Ni, Pb and Cd) accumulation and distribution. The results showed that the sediment samples have high concentration of heavy metals especially, the essential metals like Fe, than those recorded in roots and leaves of mangrove plants. Multi-statistical analyses Pearson’s correlation coefficients, CF, Igeo, BCF and TF analyses are widely used to distinguish the correlations among metals and the sources of these elements. Strongly positive correlations were observed in mangrove sediments between Zn and each of Cu, Ni as well as between Cu, Ni, Cd and Fe, in both studied sites indicating a good proxy for terrigenous material. The recorded levels of Fe, Zn, Cu and Ni in mangrove sediments were higher than the Red Sea, Gulf of Aqaba and Tanaznia sediments, while Pb and Cd were lower than those recorded from background continental crust and sediment quality guidelines (ERL). The EF values for heavy metals indicated weak enrichment and reflect the local mineralogy rather than contamination. In addition, the values of CF indicated that the mangrove sediments of studied samples are low contaminated with Fe, Zn, Cu, Ni and Pb, while Cd value indicateds moderately contamination. Therefore, the average values of Igeoin the two studied locations indicated unpolluted to moderately polluted sediments. The metal concentrations in these sites were either derived from similar sources of nearby Red Sea mountains or experienced analogous biogeochemical or accumulation processes. The obtained different correlations of heavy metals in the organs of mangrove plants may be attributed to the differences in the bioavailability of trace metals for the plants, the physicochemical properties of sediments or waters. BCFs and TFs values were basically less than one, except for TF of Ni and Pb as well as TF of Fe in two organs of mangrove at both studied sites, indicating that this mangrove species tend to restrict metal sediments-roots and roots-leaves transformations, guaranteeing the conduction of various important metabolic activities including photosynthesis in the above ground parts and confirmed that the Avicennia marina has the tendency to accumulate and translocate the heavy metals.